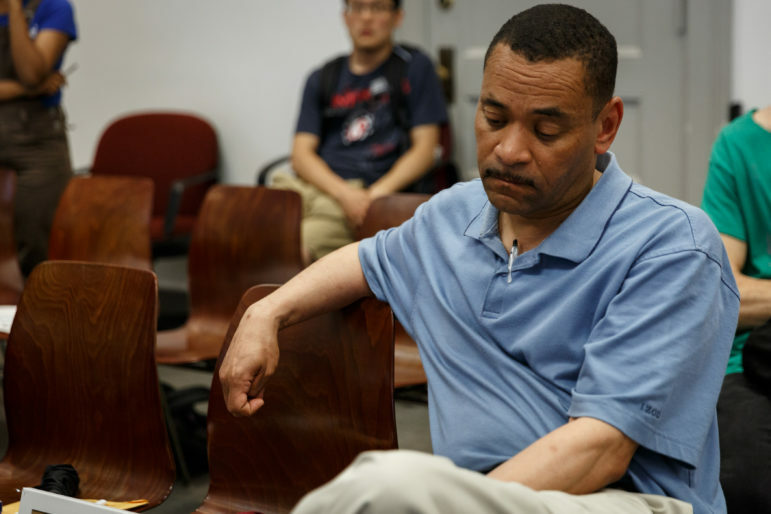 O’Harold Hoots, a displaced resident from the Penn Plaza complex, was the first of nearly 40 opponents to the proposed development to speak during Tuesday's meeting of the planning commission. Hoots asked that the commission consider the human face of those that would be negatively affected by the redevelopment. Jackie Smith, Ashley Cox, Dan Kubis, Rachel Brown, Adam Clark… The list read before the City of Pittsburgh Planning Commission on Tuesday afternoon included the names of almost 1,300 people who wrote letters to the commission, opposing the development plan proposed by LG Realty for the former site of Penn Plaza Apartments. After more than four hours, the commission voted to approve design plans for the $150 million development in East Liberty. 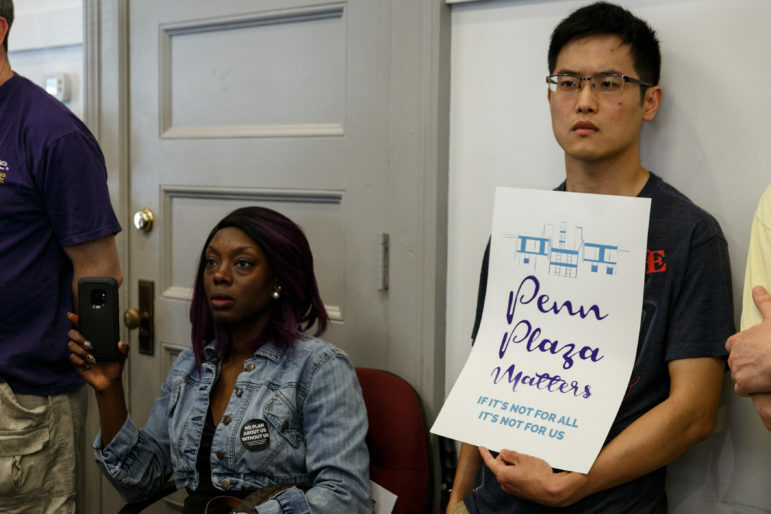 One year following the controversial demolition of Penn Plaza and after six months of mediation between the community and developers, LG Realty presented plans to put commercial retail space, a park and several office buildings at the former site of affordable housing. About 30 to 40 people spoke at the meeting, some of them in support of the project. 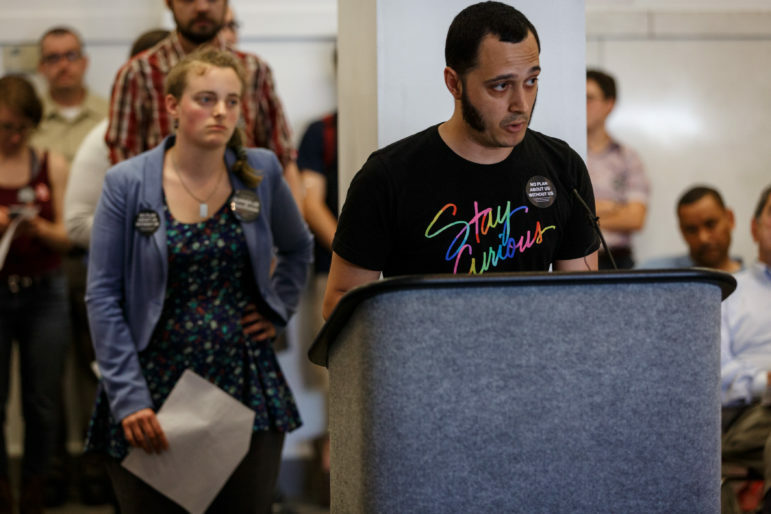 A few of them took their three minutes of time at the podium to read the names of the people who submitted letters opposing the Pennley Park South Redevelopment Plan. 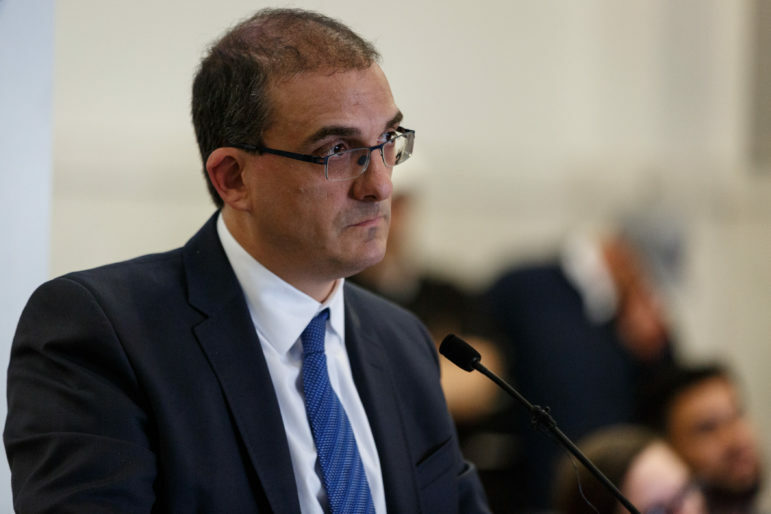 João Martins addresses the city planning commission. He was one of dozens who had three minutes of input at the public meeting. 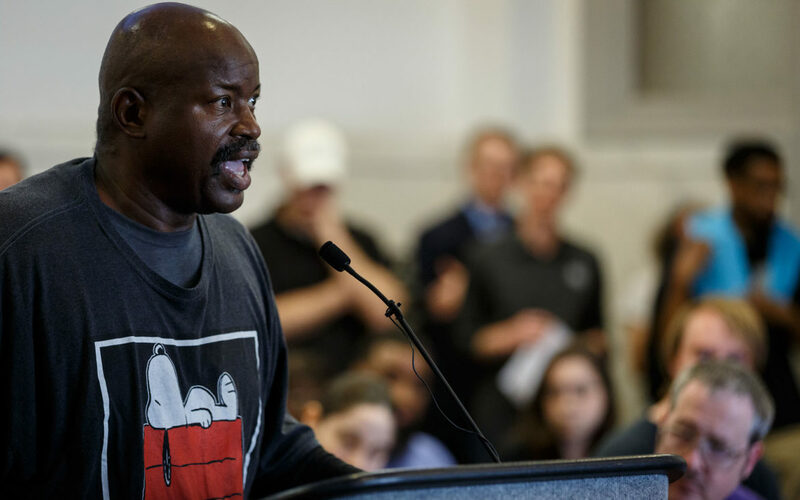 Several speakers used their time to read the names of people who had submitted letters of opposition to the redevelopment of the former Penn Plaza site. Some of the people at the podium acknowledged that, as property owners, LG Realty had met many of the zoning requirements but that the choice before them was not one based off of requirements alone; they said it was also a moral one. The property is privately owned and its owners have the right to do what they will with it. A primary reason LG Realty is having to go through this process is because they seek to increase the height of their buildings beyond what current zoning allows. Though the commission approved their plans Tuesday, 4-2, LG Realty still didn't get the full height they requested. 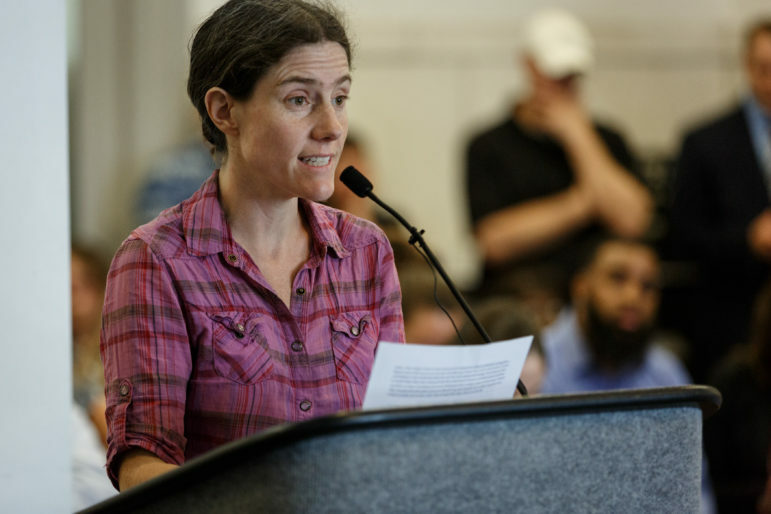 The commission also added a requirement for a community gathering space and formalized a “resolution of concern,” asking the city to allow the commission to consider additional factors in making planning decisions, like social and environmental impacts. 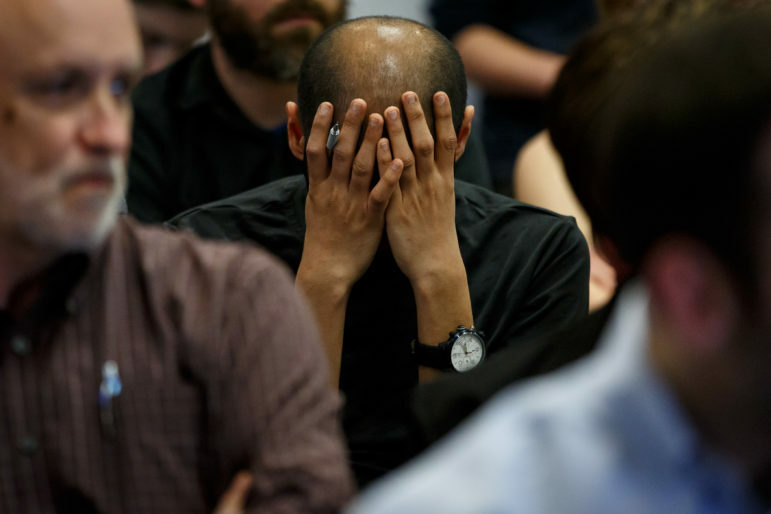 "...Our public process around community development is broken." Some opponents streamed the meeting live for those who were unable to attend. 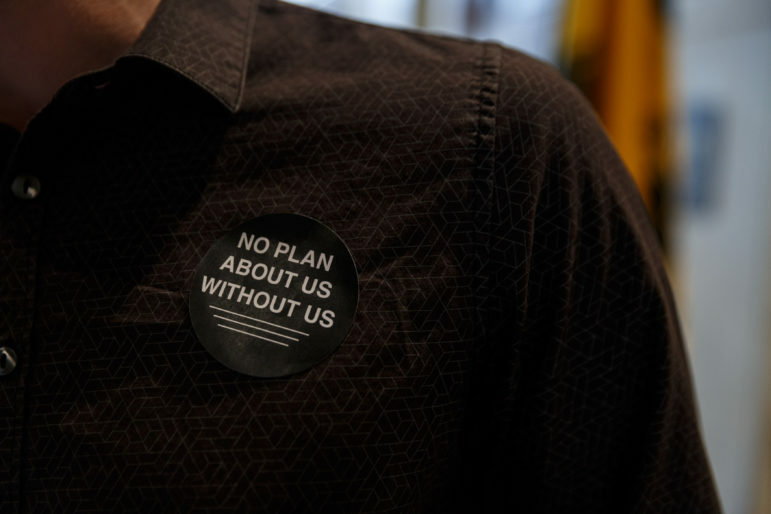 Some of those in opposition to the proposed redevelopment wore stickers, echoing the grievances that the community had not been properly involved in the planning process. 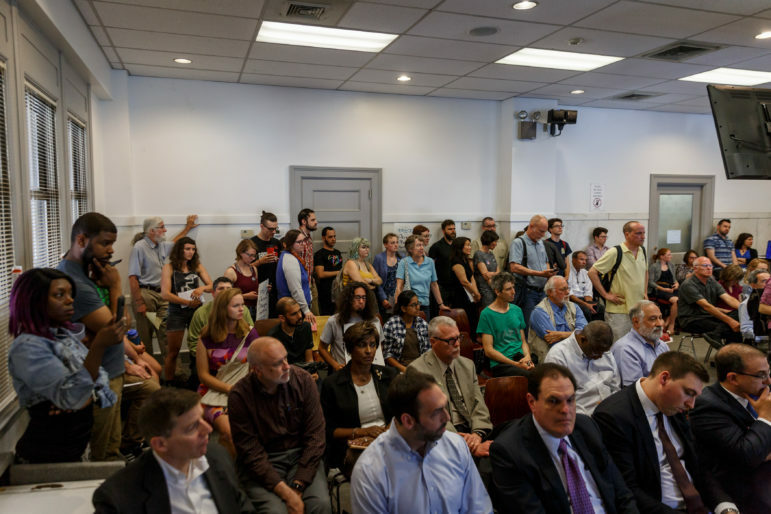 The room at 200 Ross Street was filled to capacity, with standing room only, during Tuesday's city planning commission meeting. 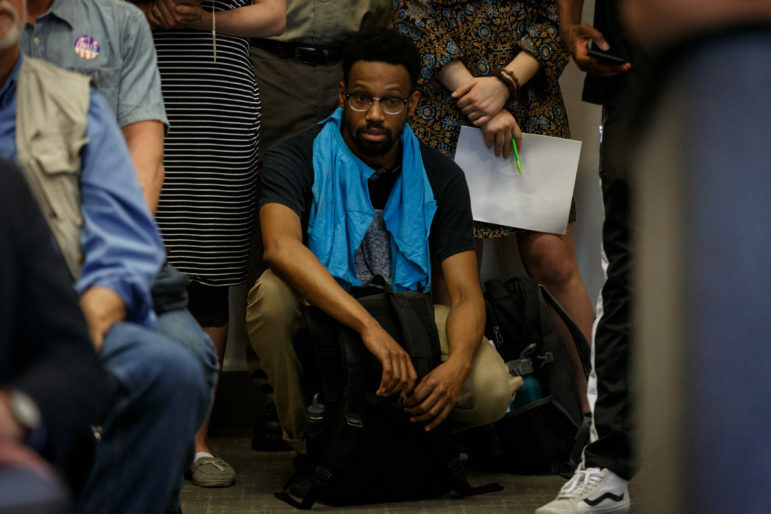 The majority of attendees stayed throughout the hours-long meeting of presentations and citizen input, waiting to learn whether or not the commission would approve the proposed project. The LG Realty team proposing the project at the former Penn Plaza site sat in the front row. 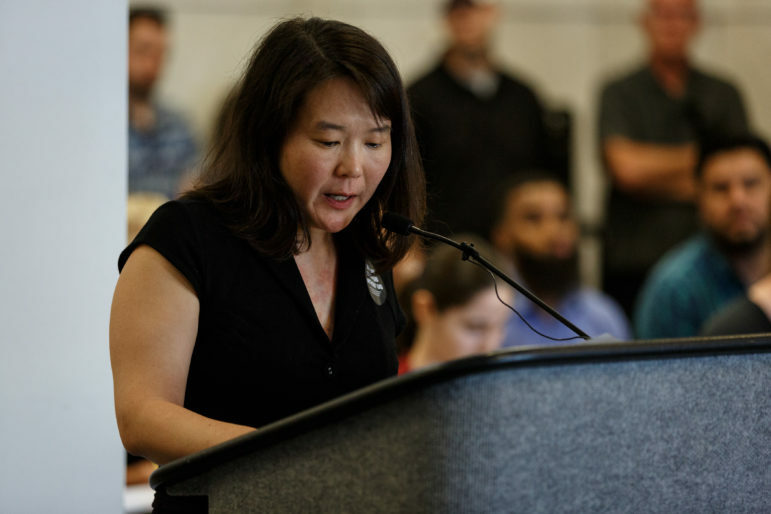 Judy Suh was one of about 40 people who spoke out against the proposed redevelopment project. Jessica McPherson also voiced her concerns about the redevelopment of the former Penn Plaza site. Mediator Bill Pietragallo speaks to the commissioners as LG Realty’s attorney, Jonathan Kamin (left), listens. Attorney for LG Realty Jonathan Kamin listens as the city planning commission raises some of their concerns with the proposed project. 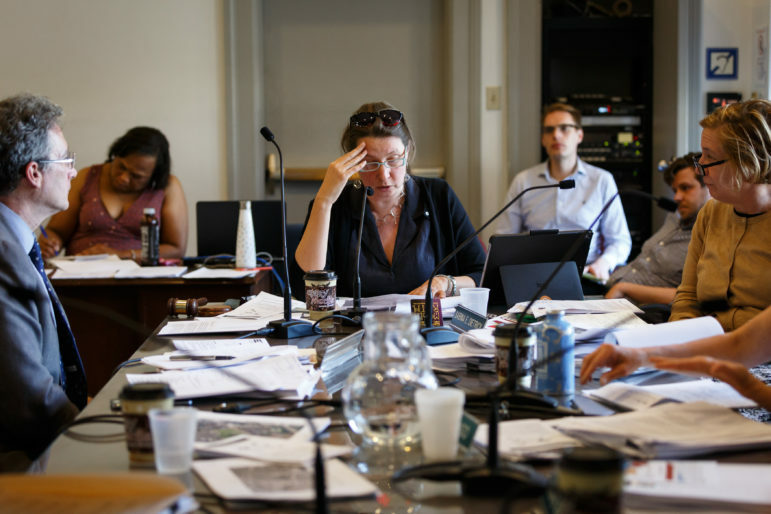 The concerns included the lack of community involvement through the process, the lack of parking at the East Liberty site and the proposed height of the building. Christine Mondor, chair of the City of Pittsburgh Planning Commission, addresses the rest of the committee as they begin to deliberate about the Pennley Park South Redevelopment Plan. The commission had listened to nearly five hours of presentations and citizen voices by this point. The attendees listened intently to the commissioners' deliberation of the proposed project. 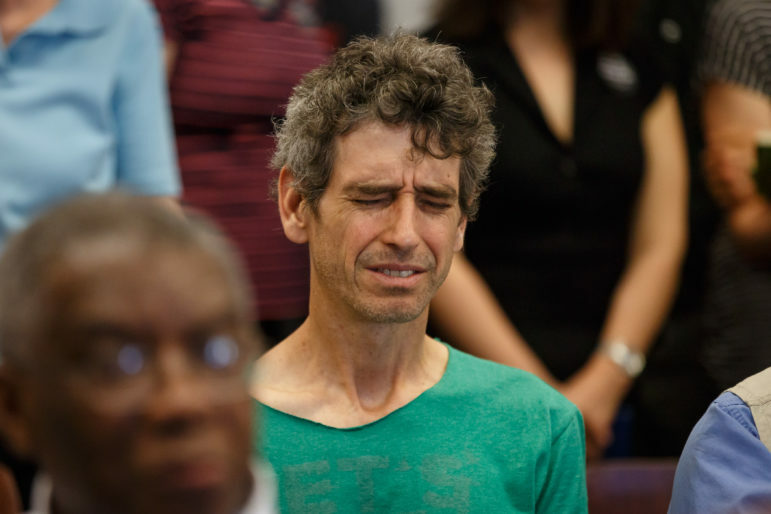 A member of the Penn Plaza Support & Action group reacts after the commission's decision to approve the design plans. An opponent to the redevelopment of the former Penn Plaza site reacts upon the commission's approval. Alan Lewandowski was particularly upset about the commission's decision for the future of the East Liberty site. 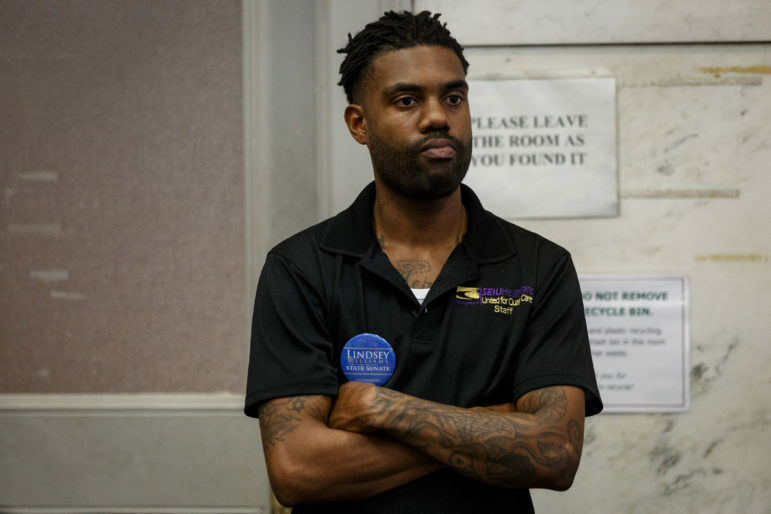 Randall Taylor, a core organizer within the Penn Plaza Support & Action group and a resident displaced from Penn Plaza, reacts after the commission's vote. 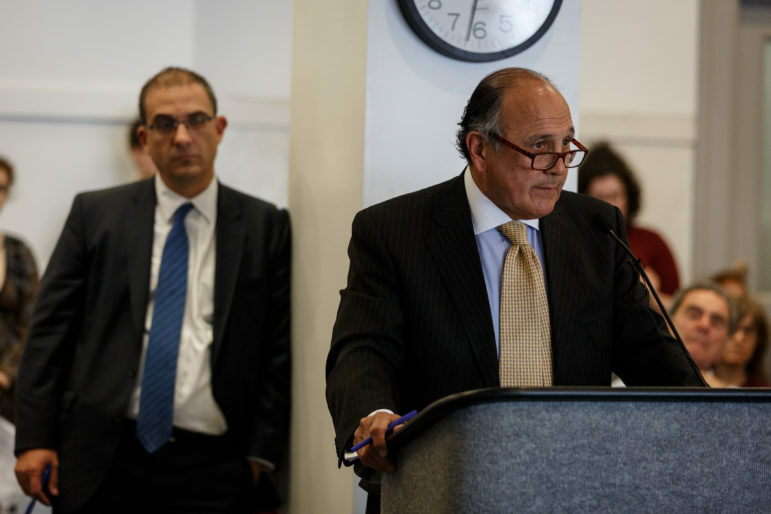 Following nearly five hours of presentations and individual speakers at Tuesday's meeting of the city planning commission, the commission voted to approve the Pennley Park South Redevelopment Plan proposed by LG Realty. 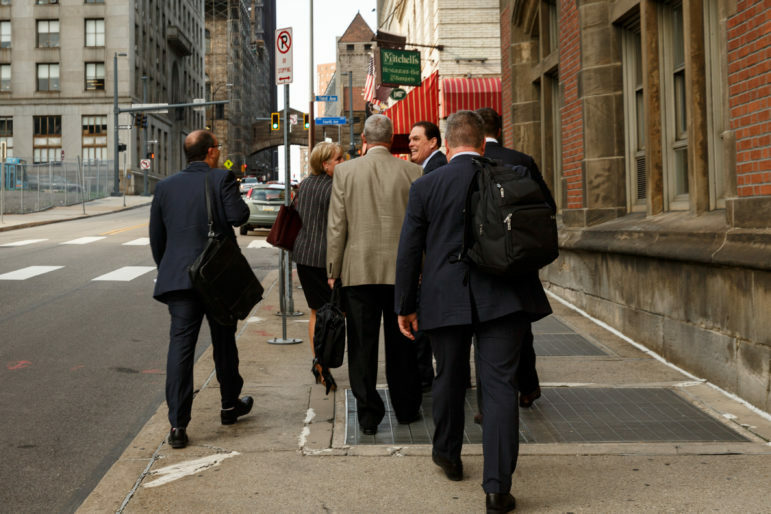 The team of LG Realty developers, architects, attorneys and supporters here are pictured leaving the meeting.